In October 2016, the International Maritime Organization determined that the MARPOL Annex VI Global Sulfur Cap would come into force on January 1st 2020 – rather than be deferred to 2025. The effect has been to thrust an often-overlooked corner of the petroleum products market into the limelight as shipping companies, refiners and other stakeholders scramble to understand the implications. Just how much fuel will be affected? It depends on who you talk to but the estimate by EnSys’ marine partner Navigistics is that 4 – 4.5 mb/d of high sulfur marine fuel will need to be switched to 0.5% fuel. This is to achieve full compliance and is based on low scrubber penetration by 2020. Scrubber orders have been disappointing; LNG is picking up interest but is more of a long-term solution. This leaves the burden on the refining sector to switch to compliant fuel. Some organizations and analysts are positive that the full required ‘switch volume’ can be supplied in 2020. EnSys-Navigistics, based on global (WORLD Model) projections, have a more conservative view that more like 3 mb/d is an achievable switch volume, at least in the first part of 2020. What we see from our modeling is refiners maximizing throughputs on key units notably cokers, hydrocrackers and desulfurization – with potential ‘back end’ constraints for hydrogen and sulfur plant to handle the increased sulfur recovery load. This has repercussions for crude oil (and product) trade as strained market economics lead to a significant redirection of crudes both sweet and sour. We see this as a worldwide phenomenon but with North American crude flows very much ‘in the thick’ of events, with potential changes including marked decreases in US imports from Latin America, Africa and elsewhere offset by increases from especially the Middle East – and potential changes in crude export flows. The changes we project in our modeling may overstate the real potential as ownership interests, term contracts etc. could act to reduce the degree to which crude routings do shift. Whatever happens, the IMO Rule will have substantial impacts and will require some combination of investments in either scrubbers, refining and/or alternative fuels (principally LNG) to reach a new market equilibrium. 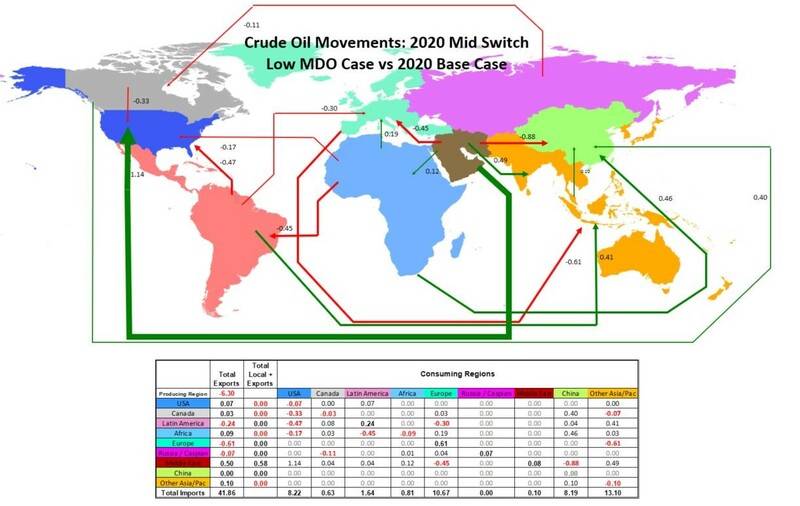 As we generate 2020 updates we will keep Logistics Monthly readers informed on the implications for North American crude flows.